Richard A. Hurt, left, appeared with his attorney, Courtenay Craig, in Mason County Magistrate Court in August 2016. Craig represented Hurt at Tuesday’s sentencing in Mason County Circuit Court. 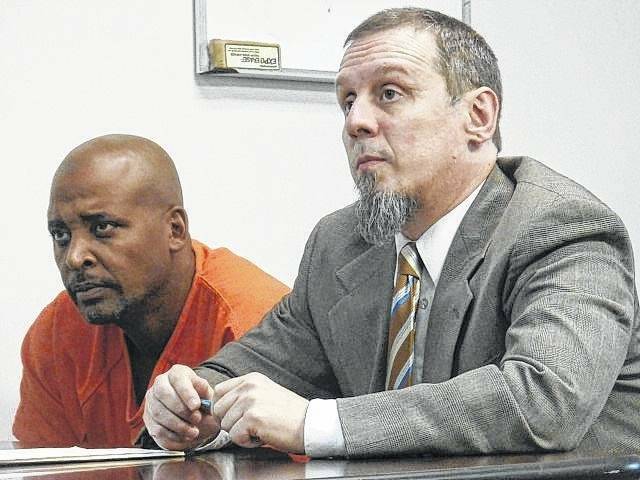 POINT PLEASANT, W.Va. — Richard Hurt, 49, of Gallipolis, a man who was sentenced in Ohio’s Gallia Court of Common Pleas in February 2017 to four years in an Ohio facility for the third-degree felony of tampering with evidence and fifth-degree felony of abuse of a a corpse, was sentenced to one to five years in Mason County Circuit Court in West Virginia for concealment of a deceased human body, Tuesday morning. Hurt’s West Virginia sentence will not begin until all of his Ohio time is served. Circuit Court Judge Lora Dyer ordered the sentence to be consecutive, rather than concurrent. This means his prison sentences will not overlap and will be served separately. At minimum, he must serve one year in a West Virginia state facility before he can be considered for any kind of parole. He could not serve more than five years in prison, however. This was considered the maximum punishment allowed by West Virginia law. Hurt previously pleaded guilty to the crime, January 21. He also previously admitted to dismembering the body of Gallia resident Jessica Berry in Ohio and then hid her remains at a home outside the city limits of Point Pleasant in summer 2016. Ronald F. Stein, II, served as the prosecuting attorney and Courtenay Craig served as defense counsel. Craig argued that Hurt’s sentence should be served concurrently with the Ohio sentence because while he hid the body in one state and dismembered it in another which was technically considered two different crimes, they were both created from the same act and the difference was in crossing jurisdictions. Making a victim impact statement at the proceeding was Berry’s mother, Tammy Taylor. Taylor said she felt Hurt deserved any sort of punishment he could get and went on to say that the crimes he committed were the kinds of things you heard about on television or in movies and one never expected such things to take place around their family. At some point, Berry died. Hurt dismembered her with a saw and placed her in trash bags before burying her at a residence on Abby Lane in the Point Pleasant area a few days later. His last sentencing hearing would indicate he said he had been drinking. Berry would eventually be declared as missing before her remains were discovered July 30, 2016. She was reported missing July 24, the same year.